LIFEPAC 12th Grade Language Arts focuses on rich and interesting British Literature. Units cover written works from: English Literature, Elizabethan Literature, 17th and 18th Century Literature, Poetry: Romantic and Victorian, and the Worth of Words. Colorfully illustrated worktexts inspire your student's as they study Beowulf, Canterbury Tales, Paradise Lost, Hamlet and the Sonnets. Students will also dive into a diverse array of poets including--Shakespeare, Milton, Pope, Swift, Johnson, Wordsworth, Coleridge, Byron, She'lley, Keats, Tennyson, and the Brownings. Creative writing techniques are also taught in this exciting course. 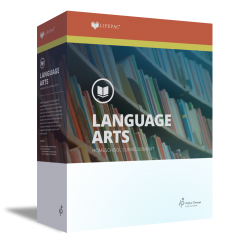 The LIFEPAC 12th Grade Language Arts Set contains ten worktexts and a teacher's guide.